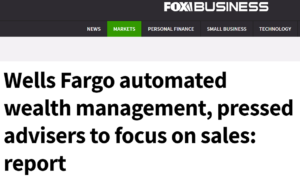 At this point, if you STILL have any financial relationship with Wells Fargo, you have implicitly given them permission to pillage your assets, harvest your organs, sell of whatever is left to fertilizer companies as feedstock. If you missed the litany of negative headlines, feel free to peruse the smorgasbord I’ve compiled below. As it turns out, millions of people do still have some level of financial relationship with Wells Fargo. On the investment side alone, Wells Fargo “manages $1.6 trillion in client assets and employs 14,500 advisers who work at about 5,360 of its 6,000 retail branches, as well as in stand-alone investment offices for wealthy clients.” That got me to wondering… what exactly would it take for someone to sever their relationship with Wells Fargo or any financial institution with a track record of wrongdoing? Think about other aspects of your life. I’ve seen plenty of people walk out of restaurants because of poor food or service, saying they’re never coming back. I’ve witnessed moviegoers head for the exit fifteen minutes into a bad flick. Your favorite sports team getting blown out? Many fans bail. People have decidedly little patience for poor products, services, and experiences. Why? Because so many other options exist. In today’s hyper-competitive world, if a business fails to deliver – let alone if they engage in questionable or illegal practices – you simply go elsewhere. So why doesn’t this extend to our finances, where there is much more at stake? I can’t explain it, but people tend to have a unique relationship with their personal finances. Don’t get enough free bread sticks at Olive Garden? Complain. A broker pushes an expensive, underperforming investment? No big deal. Is it a lack of knowledge? Not enough hours in the day to pay attention? Don’t care?